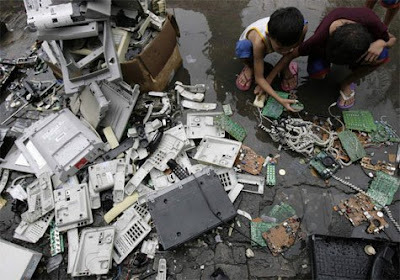 Children sort through discarded electronic equipment in search of copper parts, that can be sold for cash, inside a slum area in Manila's financial district of Makati City. Very disturbing. Yet there are worse scenes of children working here in Manila. Minor nitpick: Makati City is not a "district" of Manila. It's one of the cities that make up "Metro Manila" The city named "Manila" is our national capital and is one of the cities in Metro Manila. Foreigners and provincials refer to Metro Manila as just "Manila" though.